This is surprising. Marty Peretz just bought us, and I had no idea we were even for sale, or even who Marty Peretz was. By us, I mean both the writers and the site, Et tu, Mr. Destructo? 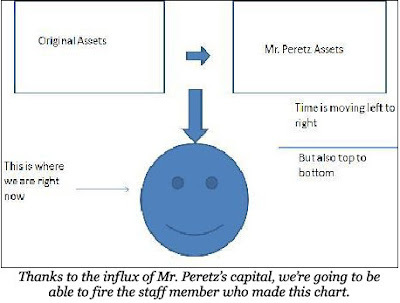 Mr. Peretz will be writing his own column for us, as a term of his investment. I don’t know the subject, but Mr. Peretz has given me to understand it is tentatively titled "Tuesdays with Marty." I'm a little confused about this myself, so let me break it down for you. Hopefully, laying out a full explanation will help me get a better handle on this business as well. Marty Peretz was the owner of The New Republic from 1974-2007, and since then has remained the editor-in-chief (although I'm told that's more of an emeritus position these days), despite divesting his ownership stake in that year. Recently, Mr. Peretz apparently decided to expand his journalistic horizons from airy, highbrow op-ed on to humor-and-commentary virtual publications channeled through the voices of historical and popular media personalities. His representatives insist this is a natural progression. Having borne witness to the changes and challenges confronting old journalism and wanting to prove his success story was no fluke, he's encouraged new journalistic organs to expand and thrive. Evidently, we are now one of them. • Mr. Peretz subscribes to a private analytics-alert service, sort of like a combination of Google Analytics and Google Alerts. This service gives him automatic notification when journalism-oriented websites surpass a certain number of pageloads and offsite alerts indicating growing popularity. • Alerted to this change, Mr. Peretz instructed his assistant to contact us and discuss investment opportunities. The terms were these: in exchange for paying expenses incurred to date, and for paying our creative team an undisclosed salary, Mr. Peretz owns a 25% stake in our profits going forward before expenses, including but not limited to any other media projects derived from or developed based on our content. Further, Mr. Peretz will use his media promotional real estate to include online text- and text-and-image-based ads for this site. 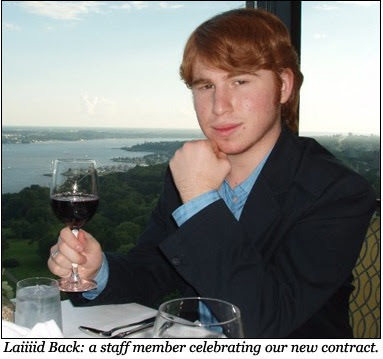 Our content, contributors and existing editorial structure will remain unchanged, excepting the addition of Mr. Peretz's new column, which will take advantage of our alternative format to deliver more “controversial” content. We hope these changes will not distress our regular readers. To be blunt, we don't believe you'll notice any, save the addition of more regular publication of a new column. Everything else should remain as you've remembered it, only better. As to charges that we have sold out, we remain indifferent. We've none of us pretended to be doing this for noble and selfless reasons, and we have taken what steps possible to realize a profit from our sweat equity. Had Mr. Peretz — or Mr. Harmon, really, as I spoke to Mr. Peretz but once and he seemed very busy — extended an olive branch while holding some massive halberd behind his back, obviously we would have turned him down. Had this been some faustian bargain for our names or opinions, for some sacrifice of principle, obviously we would have turned him down. But this appears to be merely a mutually beneficial investment in the development and marketing of existing content while providing a new voice for our reading public. And we have always sought new voices. We hope you will welcome Mr. Peretz. "Tuesdays with Marty" will make its first appearance next week, on September 21. Together we look forward to exploring dynamic new frontiers in online alternative journalism.